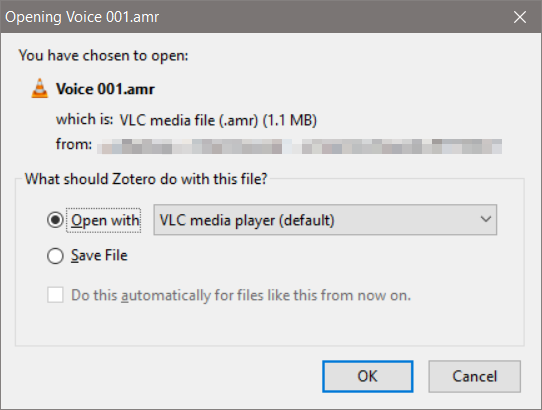 Add new attachment open a windows "open as"
I am trying to add multiple audio files (.amr...) to an item. So I right-click on that item, select "Add attachment" and then Attach Link to file. I then navigate to the folder containing the files I want to attached. I select them all and click on "open". What ever I will choose, the others files I have selected aren't attached. This means that I can't attach multiple files at once, I can only attach them one by one. I choose another default programs than vlc (windows media player), but I still get the same pop up. Any idea on how I can solve this? Thanks a lot for your time an your help! Apparently, I didn't do the debugging correctly. The "open as" pop up only appear on .amr files (.mp3 and .m4a are attached correctly). I simply converted all my .amr to .mp3 with Audacity, so I could get around the pop up. But the mystery about what how to import multiple .amr at once still remains.